3001 AUGUSTUS EICHEL 1900 11/18/2011 HEADSTONE LAYING ON GROUND OUTSIDE THE FAMILY PLOT OF CAPT. JON ROSE. SUBSEQUENTLY MADE FOR HIM AND HIS WIFE, HANNAH ROSE. 5/23/2017 THE SINGLE HEADSTONE FOR AUGUSTUS EICHEL MOVED TO SOUTHAMPTON HISTORICAL SOCIETY. 3003 AUSTIN ROSE 1891 9/87/2013 HEADSTONE LOOSE ON PEDESTAL. RESET HEADSTONE TO ITS PEDESTAL. 3004 DAVID ROSE 1886 5/19/2012 RESET FOOT STONE. 8/10-9/8/2013 PEDESTAL DETEROIATING; MADE REPAIRS ON PEDESTAL AND RESET THE HEADSTONE. 3006 JEREMIAH REEVE 7/10/1866 2/12/2013 HEADSTONE NOT ATTACHED TO ITS PEDESTAL. CLARENCE HAVENS 12/5/1873 2/13-2/26/2013 REPAIRS MADE TO PEDESTAL; HEADSTONE RESET INTO PEDESTAL; HEADSTONE RESET AT GRAVESITE. 3008 CHARLES REEVE 1923 1/11/2013 HEADSTONE ON GROUND, BROKEN FROM ITS PEDESTAL. PAUL HATCH REPAIR ASSISTED BY D. DELANEY. ADALIDE REEVE 8/21/2013 FOOT STONES OF CHARLES AND ADALIDE REEVE RESET. 8/23-24/2013 CONCRETE ADDED TO FOUNDATION BENEATH PEDISTAL. 3009/1 ADDIE A. REEVE 1898 1/11/2012 HEADSTONE BROKEN FROM ITS PEDESTAL. PAUL HATCH REPAIR, ASSISTED BY D. DELANEY. 4/1/2012 MORTAR RESIDUE CLEANED FROM PEDESTAL. 7/29/2013 EXCESS EPOXY CLEANED OFF PEDESTAL. 9/20/2013 MORTAR ADDED AT JOINT BETWEEN PEDESTAL AND HEADSTONE. 3010 BLANCHE REEVE 1874 11/5/2011 PEDESTAL DOWN UNDER THE GROUND. DUG AROUND PEDESTAL AND RAISED IT. LEVELED PEDESTAL AND BACKFILLED. 3011 JEREMIAH REEVE 1880 11/5/2011 PEDESTAL UNDERGROUND. DUG AROUND RAISED, LEVELED, AND BACKFILLED. 3012 JEREMIAH D. REEVES 1854 11/3/2011 HEADSTONE LEANING; DUG AROUND HEADSTONE AND RESET. 3013 JETUR F. REEVES 1850 11/3/2011 HEADSTONE LEANING; DUG AROUND HEADSTONE AND RESET. 3014 MARIA FOURNIER REEVE 1887 11/6/2011 HEADSTONE OFF ITS PEDESTAL AND BROKEN. 4/5-5/14/2011 BROKEN TONGUE OF HEADSTONE REPAIRED. FOOT STONE RESET. 1/12/2013 HEADSTONE REPAIRED TO ITS PEDESTAL. WORK PERFORMED BY PAUL HATCH, ASSISTED BY D. DELANEY. 3015 JEREMIAH REEVE 1884 11/6/2011 HEADSTONE OFF ITS BASE AND BROKEN INTO SEVERAL PIECES. 1/12/2013 HEADSTONE REPAIRED AND MOUNTED ON PEDESTAL. WORK PERFORMED BY PAUL HATCH, ASSISTED BY D. DELANEY. 7/29-8/7/2013 REMOVED DETERORIATING MORTAR AT HEADSTONE PEDESTAL EDGE. REMOVED OVERFLOW FROM RESIDUE. MORTAR ADDED TO BREAK LINES AND HEADSTONE PEDESTAL JOINT. 3016 EMMA A. JENNINGS 1915 11/6/2011 HEADSTONE BROKEN INTO TWO SECTIONS AND ON THE GROUND. 11/11/2013 HEADSTONE REPAIRED AND MOUNTED ONTO ITS PEDESTAL. WORK PERFORMED BY PAUL HATCH, ASSISTED BY D. DELANEY. 7/29-8/2/2013 CLEANED EXCESS EPOXY; MORTAR ADDED TO CRACK LINES. RESTORED MISSING RIGHT FRONT CORNER OF HEADSTONE WITH MORTAR. DECORATIVE MORTAR ADDED TO BREAK LINES. 3017 WILLIE J. WEBSTER 1863 11/14/2011 HEADSTONE BROKEN FROM CEMENT PEDESTAL. 11/23/2011 REPAIRED HEADSTONE AND RETURNED TO ITS GRAVESITE. 8/11/2013 MORTAR ADDED TO HEADSTONE AND PEDESTAL JOINT. 7/15/2016 HEADSTONE LOOSE; REPAIRED HEADSTONE TO BASE. 7/22/2016 DECORATIVDE MORTAR ADDED TO BREAK LINES. 10/28/2017 DISCOVERED FOOT STONE BROKEN; REPAIRED AND RESET ON 10/31/2017. 3018 JOHN H. BOWMAN 1884 11/6/2011 HEADSTONE BROKEN LEFT FRONT CORNER. HEADSTONE LAYING ON GROUND. PEDESTAL AND BASE SHIFITING. FOUND MISSING FRONT PIECE. LEVELED PEDESTAL AND BASE. 11/22/2011 REPAIRED HEADSTONE AND SET HEADSTONE TO PEDESTAL. 9/15/2013 LEVELED THE BASE OF THE HEADSTONE, SET THE PEDESTAL, AND SET THE HEADSTONE. 3120 MRS. EMMA WHITE 1825 6/5/2012 HEADSTONE LEANING AND HAS A PIECE MISSING AT LOWER RIGHT SIDE. DUG AROUND HEADSTONE AND RESET. 6/10/2015 DECORATIVE MORTAR REPAIR TO LOWER RIGHT EDGE OF HEADSTONE. 3121 MRS. ACHSAH WHITE 1817 5/28/2012 HEADSTONE LEANING. RESET FOOTSTONE AT GRAVESITE. 5/15/2016 RESET FOOTSTONE, WHICH WAS LEANING. 3123 EDWARD HALSEY WHITE 1849 5/15/2016 FOOTSTONE LEANING. DUG OUT FOOTSTONE AND RESET. 7/18/2016 HEADSTONE LOOSE AT PEDESTAL. RESET PEDESTAL TO ITS BASE. RESET HEADSTONE TO THE PEDESTAL. 3125 JETUR ROSE 1798 11/20/2011 HEADSTONE HAS CRACK LINE ACROSS MIDDLE SECTION. FOOTSTONE LOCATED UNDERGROUND. 11/29/2011 REMOVED TWO BROKEN PIECES OF FOOTSTONE. 5/13/2012 FOOTSTONE RESET AT PROPER LOCATION. 7/19/2016 FILLED CRACK LINES AND SPACES WITH DECORATIVE BROWN MORTAR. 3126 PHEBE ROSE 1790 11/29/2011 FOOTSTONE BROKEN IN TWO PIECES. 7/19-30/2016 REPAIRED CRACKS AND SPACES OF HEADSTONE AND RESET. FOOTSTONE RESET. 3127 MRS. MARY ROSE 1800 10/19/2011 FOOTSTONE BROKEN. REPAIRED FOOTSTONE. 5/13/2012 FOOTSTONE RESET AT GRAVESITE. 7/19/2016 FILLED CRACKS AND SPACES OF HEADSTONE WITH DECORATIVE BROWN MORTAR. 3130 DAVID ROSE ESQ. 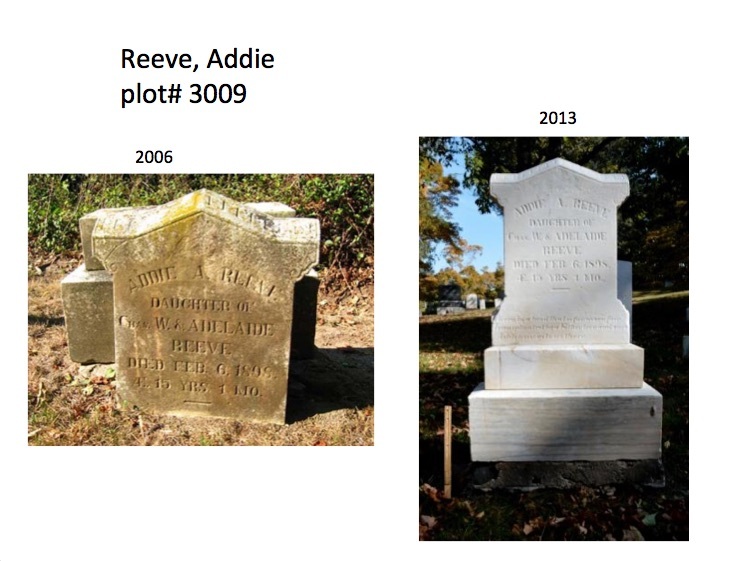 1836 1/11/2012 HEADSTONE LEANING. HEADSTONE SHOWS AN OLD HORIZONTIAL BREAK REPAIR. DUG AROUND HEADSTONE AND RESET. 5/14-15/2012 FOOTSTONE BROKEN. REPAIRED FOOTSTONE AND RESET. 4/30/2012 REPAIRED BROKEN SECTION OF HEADSTONE AND RESET IN THE EARTH. 3033 AMANDA M. REEVE 1836 11/4/2011 HEADSTONE LEANING; DUG AROUND HEADSTONE AND RESET. 3034 JETUR REEVE 1826 11/4/2011 HEADSTONE LEANING; DUG AROUND HEADSTONE AND RESET. 3035 JOEL REEVE 1831 11/4/2011 HEADSTONE LEANING; DUG AROUND HEADSTONE AND RESET. 3036 ANNA REEVE 1861 11/4/2011 HEADSTONE LEANING; DUG AROUND HEADSTONE AND RESET. 3038 ELOISE H. POST 1883 5/16/2012 FOOTSTONE LEANING, RESET THE FOOTSTONE. 3040 CAPTAIN JOSEPH R. HARRIS 1879 5/1/2012 FOOTSTONE RESET. 6/1/2012 HEADSTONE BROKEN FROM ITS CEMENT FOOTING AND LAYING ON ITS BACK. HEADSTONE RAISED AND SET IN PLACE BY PAUL HATCH. 3041 HENRY H. 2ND COOPER 1834 12/15/2011 HEADSTONE LEANING. DUG AROUND HEADSTONE AND RESET. 3042 HENRY H. COOPER 1832 12/5/2011 HEADSTONE LEANING, DUG AROUND HEADSTONE AND RESET. 2/17-21/2012 FOOTSTONE BROKEN; LOCATED BOTTOM SECTION AND REPAIRED. 3/3/2012 RESET FOOTSTONE IN THE EARTH. 3043 MARY HARRIS COOPER 1860 9/18/2013 HEADSTONE LEANING; REMOVED HEADSTONE FROM PEDESTAL. 9/20/2013 RESET HEADSTONE INTO ITS PEDESTAL. 3044 ROYAL I. HARLOW 1883 11/15/2011 HEADSTONE FACING WRONG DIRECTION (EAST). PEDESTAL NEEDED LEVELING AND RAPAIR OF ITS FOUNDATION. 5/25/2012 RELEVELED FOUNDATION AND PEDESTAL. 8/25-26/2013 RESET PEDESTAL AND FOUNDATION AND RESET THE HEADSTONE. 3045 EMMA J. HARLOW 1877 11/28/2011 HEADSTONE OUT OF ITS PEDESTAL AND NEEDS LEVELING. 4/3/2012 CLEANED OUT OLD MORTAR FROM PEDESTAL. 11/8/2011 HEADSTONE HAS BROKEN LEFT CORNER AND IS OFF THE PEDESTAL. 3046 MARIA J. HARLOW 1909 6/1/2012 HEADSTONE REPAIRED AND SET ON ITS PEDESTAL BY PAUL HATCH. 3047 CHARLES H. HARLOW 1914 11/8/2011 HEADSTONE AND PEDESTAL ON GROUND. 4/3/2012 CLEANED OUT OLD MORTAR FROM TOP OF PEDESTAL. 6/1/2012 PEDESTAL AND HEADSTONE RAISED AND SET ONTO ITS MARBLE FOOTING BY PAUL HATCH. 7/16/2016 HEADSTONE LOOSE; RAISED HEADSTONE, CLEANED OFF OLD SETTING MATERIAL; RESET HEADSTONE ONTO ITS PEDESTAL. 3048 CYNTHIA DRAKE 1867 11/9/2011 HEADSTONE BROKEN INTO THREE SECTIONS. 11/13/2012 REPAIRED BOTTOM SECTION TO MID SECTION OF THE HEADSTONE. 01/4-5/2012 REPAIRED TOP SECTION TO THE MID AND BOTTOM SECTIONS. 3049 JAMES SCOTT 1868 11/9/2011 HEADSTONE BROKEN INTO THREE SECTION AND ON GROUD. THE BOTTOM SECTION DISCOVERED UNDERGROUND. 1/3/2012 REPAIRED BOTTOM SECTION TO THE MID SECTION. 1/7/2012 REPAIRED TOP SECTION TO MID SECTION. ADDITIONAL REPAIRS TO LOWER SECTIONS MADE. 1/29/2017 HEADSTONE DOWN WITH BREAKS BETWEEN TOP, MID, AND BOTTOM SECTIONS, POSSIBLTY CAUSED BY MAINTENANCE EQUIPMENT AND/OR WIND STORM. 5/20-22/2017 REPAIRED TOP AND MID SECTION; BOTTOM SECTION NOT USEABLE. 3051 SUSANNAH SCOTT 1845 11/9/2011 HEADSTONE BROKEN IN THREE PLACES AND LAYING ON GROUND. 1/19/2012 REPAIRED BOTTOM TWO SECTIONS OF HEADSTONE. 1/21/2012 REPAIRED TOP SECTION TO ITS LOWER SECTIONS. 1/25/2012 RESET HEADSTONE AT GRAVESITE. 3057 PHILE HARRIS 1831 11/28/2011 HEADSTONE BROKEN INTO TWO SECTIONS. 12/1/2011 HEADSTONE RESET AT GRAVESITE. 8/7/2013 CRACK LINES FILLED WITH DECORATIVE MORTAR. 3058 CAPTAIN HENRY HARRIS 1851 12/2/2011 HEADSTONE LAYING ON GROUND, BROKEN INTO THREE SECTONS. THERE IS A MISSING LOWER LEFT SIDE PIECE. 12/3/2011 ADJUSTED BROKEN SECTIONS TO BE REPAIRED. 12/9/2011 REPAIRED TOP SECTION TO BOTTOM TWO SECTIONS. 12/10/2011 HEADSTONE RESET AT GRAVESITE. 1/24/2012 HEADSTONE DOWN AND BROKEN. 8/7/2013 DECORATIVE MORTAR ADDED TO BREAK LINES. 3067 ERASTUS JENNINGS 1828 2/7/2013 HEADSTONE SEPARATED FROM ITS PEDESTAL. 2/8-13/2013 CLEANED OUT PEDESTAL SLOT; HEADSTONE REPAIRED TO ITS PEDESTAL AND RESET AT GRAVESITE. 3069 JAMES ROBINSON 1890 11/5/2011 HEADSTONE LEANING; DUG AROUND HEADSTONE AND PEDESTAL AND LEVELED. 3070 EDDIE JENNINGS 1881 9/11/2012 HEADSTONE NOT SECURED IN PEDESTAL. REPAIRS MADE TO PEDESTAL AND RESET AT GRAVESITE ON 9/17/2012. 3073 JAMES JENNINGS 1822 11/7/2011 HEADSTONE LAYING ON GROUND. BROKEN SECTION FOUND UNDER THE GROUND. 12/13-18/2011 REPAIRED BROKEN SECTION OF HEADSTONE. RESET THE HEADSTONE 4” FORWARD OF ITS ORIGINAL LOCATION DUE TO TREE ROOTS. 3076 MINERVA AUBRYHIMS 1857 9/22/2012 HEADSTONE BROKEN FROM BOTTOM SECTION. HEADSTONE REPAIRED AND RESET. 3079 INFANT HARRIS 1818 10/11-12/1/2011 HEADSTONE LAYING ON GROUND BROKEN. REPAIRED BROKEN HEADSTONE AND RESET AT GRAVESITE. 3081 STEPHEN HARRIS 1818 12/4/2011 HEADSTONE LEANING; DUG OUT HEADSTONE AND RESET IN THE EARTH. 5/4/2016 HEADSTONE LEANING; DUG OUT UNDERGROUND ROOT AND RESET HEADSTONE. 3081A SIDNEY HARRIS 1821 5/14/2016 HEADSTONE LEANING; DUG AROUND HEADSTONE AND RESET. 3082 JANE HARRIS 1829 12/4/2011 HEADSTONE LEANING; DUG OUT HEADSTONE AND RESET INTO THE EARTH. 3083 MARY JENNINGS 1834 3/30/2013 FOOTSTONE FOUND BELOW GROUND ON SOUTH SLOPE. RESET FOOTSTONE AT GRAVESITE. 3084 SAMUEL JENNINGS 1827 12/11/2011 HEADSTONE BROKEN IN THREE SECTIONS, PLUS TWO RIGHT SIDE EDGE PIECES. 12/13-16/2011 REPAIRED LOWER TWO SECTIONS; REPAIRED TOP SECTION AND RESET AT GRAVESITE. 3085 WILLIAM H. HARRIS 1868 5/15/2012 HEADSTONE NEEDS ITS PEDESTAL LEVELED. FOOTSTONE STRAIGHTENED. MAXIA HARRIS 1894 9/30/2012 LEVELED BASE AND PEDESTAL. LEVELED HEADSTONE TO ITS PEDESTAL. 5/15/2016 FOOTSTONE OF MAXIA RESET. 3086 EMMANUEL THOMAS 1908 12/5/2011 HEADSTONE LEANING; BROKEN BELOW GROUND. 12/16-20/2011 HEADSTONE BREAK REPAIRED AND RETURNED TO GRAVESITE. ROOTS REMOVED BELOW GROUND AND HEADSTONE RESET. 3087 IRENE HARRIS 1905 10/31/2017 HEADSTONE LEANING; DUG OUT HEADSTONE AND RESET. 3089 WILLIAM EDGAR PAYNE 1884 11/3/2011 HEADSTONE LEANING; DUG AROUND HEADSTONE AND DISCOVERED A BREAK AT THE BASE. HEADSTONE REPAIRED TO ITS CONCRETE BASE PEDESTAL. HEADSTONE RESET. 3093 ELIZABETH PAYNE 1884 12/5/2011 HEADSTONE LEANING; DUG AROUND HEADSTONE AND RESET INTO ITS CEMENT PEDESTAL. 3097 EMMA ROSE 1897 O9/23/1012 HEADSTONE LOOSE AT PEDESTAL. HEADSTONE RESET INTO PEDESTAL AND BOTH RESET INTO THE EARTH. 3100 ALBERT ROSE 1887 5/16/2012 FOOTSTONE SET AT PROPER LOCATION. 9/4/2012 UNEARTHED A SECTION OF HEADSTONE. BASE SECTION IS EMBEDDED IN CONCRETE. MID SECTION OF HEADSTONE IS MISSING. 10/5-11/17/2012 ADJUSTMENTS MADE TO ACCOUNT FOR MISSING SECTION. REPAIRS MADE TO HEADSTONE. 7/7/2016 HEADSTONE BROKEN AND LAYING ON GROUND. HEADSTONE REPAIRED. 7/22/2016 MORTAR ADDED TO REPAIR LINES. 3102 ELEANOR J. ROSE 1882 5/16/2012 HEADSTONE WITH ATTACHED PEDESTAL LAYING ON GROUND. 4/13/2013 NEW CONCRETE FOUNDATION CREATED. 5/4/2013 HEADSTONE AND PEDESTAL RAISED AND SET ON FOUNDATION. 10/1/2013 DECORATIVE MORTAR ADDED WHERE HEADSTONE JOINS THE PEDESTAL. 3103 MARYANN ROSE 1868 5/16/2012 FOOTSTONE PLACED AT PROPER LOCATION. 10/1/2013 DECORATIVE MORTAR ADDED WHERE HEADSTONE MEETS ITS PEDESTAL. 3107 JAMES JAGGER 1833 5/14/2012 FOOTSTONE LEANING; DUG OUT FOOTSTONE AND RESET. 3108 MARY LUPTON 1809 5/19/2012 FOOTSTONE LEANING; DUG OUT FOOTSTONE AND RESET. 3109 CHRISTOPHER LUPTON 1782 5/19/2012 FOOTSTONE LEANING AND RESET. 3111 CATHERINE ROSE 1845 5/16/2012 PEDESTAL OF HEADSTONE NEEDS RESETTING. F7 5/16/2012 FOOTSTONE RESET AT GRAVESITE. 10/23/2012 HEADSTONE AND PEDESTAL REATTACHED TO CONCRETE FOOTING. 3112 HAROLD ROSE 1837 5/31/2012 HEADSTONE LEANING. DUG OUT HEADSTONE AND FOUND A BROKEN CONCRETE FOOTING. SOME OF THE FOOTING WAS USABLE. RAISED HEADSTONE TO PROPER LEVEL AND RESET. 3115 ANN DUNN SNOOKS 1887 4/29/2012 HEADSTONE BROKEN IN TWO PIECES. DUG OUT AND STRAIGHTENED LOWER HALF OF HEADSTONE. 4/30/2012 REPAIRED TOP SECTION OF HEADSTONE. 6/10/2015 MORTAR ADDED TO CRACK LINES. 6/10/2015 DECORATIVE MORTAR REPAIRTO LOWER RIGHT EDGE OF HEADSTONE. 7/18/2016 HEADSTONE LOOSE AT PEDESTAL. RESET PEDESTAL TO ITS BASE. RESET HEADSTONE TO THE PEDESTAL. 3125 JETUR ROSE 1798 1/20/2011 HEADSTONE HAS CRACK LINE ACROSS MIDDLE SECTION. FOOTSTONE LOCATED UNDERGROUND. 7/19/2016 FILLED CRACKS AND SPACES OF HEADSTONE WITH DECORATIVE BROWN MORATR. 3128 JANE ROSE 1821 5/14/2012 FOOTSTONE OUT OF GROUND. RESET FOOTSTONE AT GRAVESITE. 3129 MARY WHITE 1834 5/14/2012 FOOTSTONE OUT OF GROUND. RESET FOOTSTONE IN PROPER LOCATION. 3130 DAVID ROSE ESQ. 1836 1/11/2012 HEADSTONE LEANING. HEADSTONE SHOWS AN OLD HORIZONTAL BREAK REPAIR. DUG AROUND HEADSTONE AND RESET. 3149 CAROLINE PARKER 1846 11/18/2012 DISCOVERED THE HEADSTONE ENTIRELY UNDERGROUND WITH BROKEN LEFT SIDE BOTTOM. HEADSTONE TEMPORARILY SET INTO EARTH AT RIGHT OF NANCY ROSE HEADSTONE. FOUND MISSING BOTTOM CENTER CORNER UNDERGROUND. 3140 HENRY P. SCOTT 1860 4/8/2012 FOOTSTONE OF JOHN SCOTT BROKEN AND MISSING BOTTOM SECTION. MISSING PIECE REPLACED AND REPAIRED TO TOP SECTION BY EVERETT HATCH ON 5/19/2012. 3144 CAROLINE JENNINGS 1898 5/14/2012 FOOTSTONE WAS BURIED UNDERGROUND. DUG OUT FOOTSTONE AND RESET. 3145 NANCY ROSE JENNINGS 1854 12/8/2011 FOOTSTONE BROKEN. TWO PIECES LOCATED UNDER THE BRUSH IN S/E CORNER OF CEMETERY. 5/14/2012 RESET THE FOOTSTONE AT THE GRAVESITE.